We're expanding upon the Boston Globe's investigative work into weight gain in Boston: "Did the Red Sox pack on the pounds?" the Globe asked. Well, why stop there? Who&apos;s Fatter, Josh Beckett Or Jessica Simpson? Did Globe reporter Bob Hohler pack on the pounds? Did the Globe's Dan Shaughnessy pack on the pounds? Did Red Sox CEO Larry Lucchino pack on the pounds? Did Red Sox owner John Henry pack on the pounds? Did former Globe columnist Mike Barnicle pack on the pounds? Did former Harvard president Larry Summers pack on the pounds? Did Harvard's Henry Louis Gates pack on the pounds? Did Mayor Thomas Menino pack on the pounds? Did Congressman Barney Frank pack on the pounds? Did Doris Kearns Goodwin pack on the pounds? Did Ben Affleck pack on the pounds? On that note, did Matt Damon pack on the pounds? Did Denis Leary pack on the pounds? Did Cheers's Kirstie Allen pack on the pounds? Did Boston (the band) pack on the pounds? Did Aerosmith's Steven Tyler pack on the pounds? Did Tom Brady's hair REVERSE pack on the pounds? Did Boston's Big Dig pack on the pounds? Did revolutionary Crispus Attucks pack on the pounds? Did Whitey Bulger pack on the pounds? Did colonial Puritan Anne Hutchinson pack on the pounds? Did Paul Revere pack on the pounds? 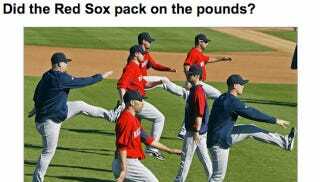 Did the Boston Cream Pie pack on the pounds? Did the Boston Duck Tour pack on the pounds? Did Boston whales pack on the pounds? Did anarchists Ferdinando Sacco and Bartolomeo Vanzetti pack on the pounds? Did Sam Adams pack on the pounds? Did the Boston Globe Sunday edition pack on the pounds?